BO165-1024.Large, Fancy Brown & White Leatherette Chess Board. This beautifully finished chess board is made with the finest quality of leatherette. It offers a great value and because of its colors it can be complimented with almost all chess pieces. The board measures 18”x 18” with 1 3/4” squares. BO200-202GN. Italian Black & Gold Pressed Leather Chesboard. The fine Italian wood and the black pressed leather of this chess board make it a perfect choice to go along with almost any type of chess pieces.This chessboard provides excellent craftsmanship and great value. It measures 15.5 x 15.5 in. The squares are 1.75 in. This beautiful Gold and Burgundy Italian pressed leather board is very unique and elegant. The board is manufactured by the best artisans in Italy. It features a beautiful border inlay and a tan leather and wood chessboard with storage compartment for all your game pieces . The board is 11" with 1" Squares. This excellent board is made in Italy from the finest Leatherette. It has beautiful art work on the borders. Combine this board with the chess pieces of your choice to create a personalized chess set. It measures 18x18 inches and it has 2 inch squares. The beautiful wood and pressed leather combination of this chess board really stands out. It is finished in black & gold and features a chest design for storage of game pieces and an attractive gold border inlay accent. It measures 14 x 14 inches with 1.25 inch squares. This excellent chess board is made in Italy from the finest Leatherette. It has beautiful art work on the borders and offers storage space inside for the protection of your Chess pieces. The board measures 14x14 inches with 1 3/8” squares. This handsome Italian leather chessboard is absolutely stunning. The tan and black playing surface is surrounded with a artistic border motif and is then finished off with contrasting ebony leather stitching. The leather playing surface can be removed revealing a felted storage compartment for all you game pieces. An exquisite item at a fantasic price! All size options available for this chess board are shown below. BO205-221GN. Gold & Black, Italian Pressed Leather Chessboard. 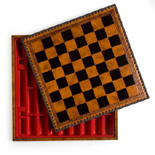 This chessboard is made of fine Italian pressed leather. The board has an elegant black and gold color combination that goes very well with almost all Chess pieces . The board features a chest storage compartment for all your game pieces. It measures 17.5 x 17.5 inches. The squares are 1.75 in.